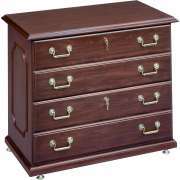 Why should you get a wooden file cabinet? 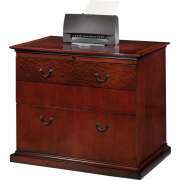 Every office needs an appropriate place to keep important papers, forms and contracts organized. 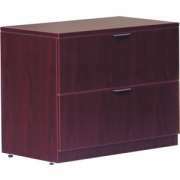 A wooden filing cabinet provides an attractive place to secure any papers that need to be stored. 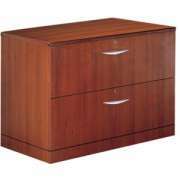 Many of our wood file cabinets are part of larger office furniture collections so they can be coordinated with your office desk or other items. 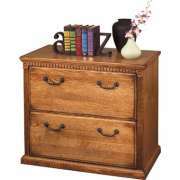 They come in a selection of attractive wood hues which create an inviting professional appearance. 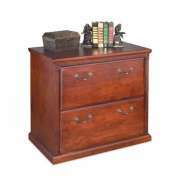 Great file storage will help all of your transactions run smoothly and efficiently. 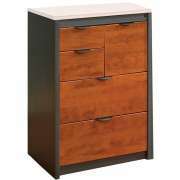 Should I get a lateral or vertical wooden file cabinet? File drawers come in two basic arrangements: lateral and vertical. Each of these configurations has its benefits, but the right one ultimately depends on what you prefer. Vertical file cabinets have deeper drawers and take up minimal wall space. This is a good arrangement if you want to put a filing system in a corner or other small space. 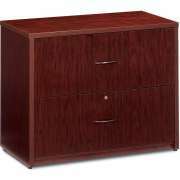 Lateral file cabinets have a larger footprint, but usually have a higher capacity. They are great for a doctor&apos;s office, school or anywhere else where lots of papers and information need to be stored together in one accessible space. What style file cabinets are best for an office? 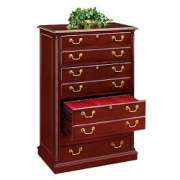 Each arrangement of wooden file drawers is complemented by distinct style. The best design for your work space depends on the image you want to project. 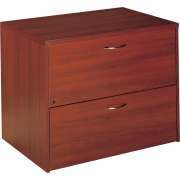 Our wood file cabinets come in both modern and classic styles. A contemporary design is ideal for a company or institution that wants to demonstrate innovation and creativity. Classic elegance is conducive to a serious professional environment such as a law office or accountancy firm. 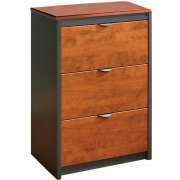 How can I make sure my wooden file cabinets match with other office furniture? To give your workspace a professional appeal, it is important to make sure that all office furniture is coordinated. There are a number of ways to accomplish this. The best way is to order all furniture from the same collection. 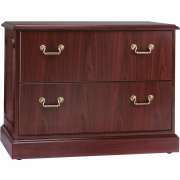 Many of our wooden file cabinets are from attractive office furniture sets so you can get the best of functionality and visual appeal. Even if you prefer to have a number of styles in your office, you can still enjoy the appeal of coordinated furniture. Rather than ordering everything from a single collection, you may choose to furnish your work space with a number of pieces in similar or complementary wood hues. When you are storing confidential documents and sensitive information, it is important to ensure that you have a way of securing papers. 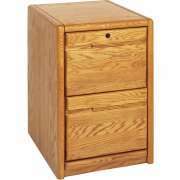 Many wood filing cabinets come with built-in locks which protect their contents from prying eyes. Some models have individually-locking drawers, which is helpful if you prefer to secure each file drawer separately. 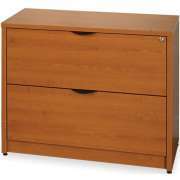 Centrally-locking drawers are convenient because you only need to unlock one lock in order to gain access to contents. Keyed locks are easy for the owner to open, providing access only to those who are authorized. 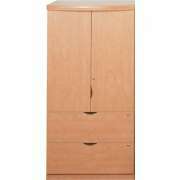 Where can I fit wood filing cabinets? 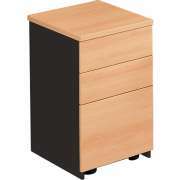 The basic freestanding model of wooden filing cabinets is useful if there is extra open wall space in an office and a paper-organizing system is needed. If there is not enough space in the office for a freestanding unit, or employees prefer a filing system that is accessible from their office desks, there are other options as well. 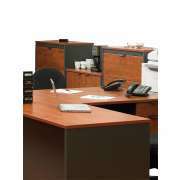 Wooden file cabinets can be arranged as an office desk pedestal which rests directly under the work surface or as a desk extension which is placed right next to the end of an executive desk. This arrangement offers the added convenience of a bit of extra work surface area. Documents might not be the only thing you need a space for in an office. While separate wooden file drawers can be quite useful, some work environments will get greater benefit from a combination unit. 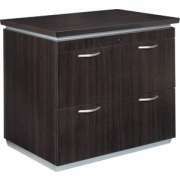 We have a number of storage units which include cabinets with shelving as well as wood file drawers. This arrangement is helpful for any work space that requires file storage and shelving for electronics, books or other items. The key to creating a successful work environment is starting with some great office furniture. 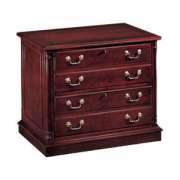 Hertz Furniture&apos;s selection of wooden file cabinets offers the winning combination of elegance and function that you need to keep a classy office organized. 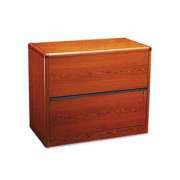 Our wood filing drawers come from leading manufacturers including Martin Furniture, High Point, Mayline and DMI.